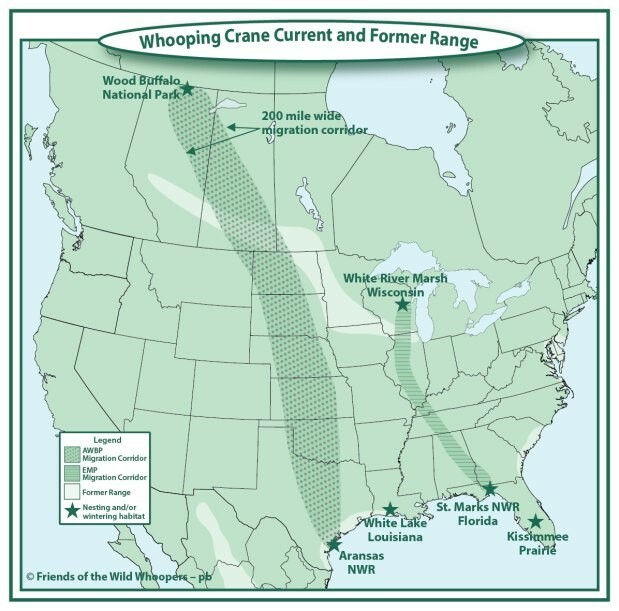 This was a pioneering project that took place from 2001-2015, run by Operation Migration, an organization dedicated to recovering endangered whooping cranes. But that was just one of many innovative and collaborative conservation efforts that have helped recover whooping cranes since the species’ numbers fell to only 15 birds in the 1940s. Shortly thereafter the North American conservation movement was born. The whooping crane was one of the first species to be listed as endangered in 1970, even before the Endangered Species Act (ESA) became law. 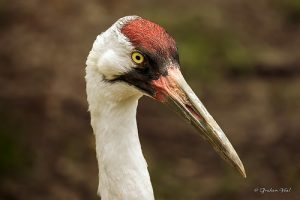 The whooping crane’s struggle was characteristic of many endangered species – overhunting, habitat loss, low reproductive output and a dangerous migration route all pushed the species to near-extinction. In the years following the listing, the Whooping Crane Eastern Partnership was formed under authority of the new ESA to establish a successful eastern migratory flock. The partnership included the U.S. Fish and Wildlife Service (Service), Operation Migration and the Wisconsin Department of Natural Resources. As of 2011, the population was up to approximately 600 (captive and wild) birds – a remarkable recovery made possible through intense efforts of multiple agencies, in addition to regulatory protections. 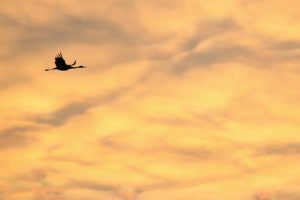 The Service described the whooping crane as a “flagship species for the North American wildlife conservation movement,” as it engaged several states and multiple stakeholders in pioneering recovery efforts throughout the bird’s migratory range. In Louisiana, there are currently an estimated 54 individuals. This includes one chick, LW3-17, who is now almost three months old. Whooping cranes have not reproduced naturally in Louisiana since 1939. A few chicks born this year, such as LW3-17, bring hope for whooping cranes successfully returning to the East Coast. Whooping crane chicks at Freeport-McMoRan Audubon Species Survival Center are costume-reared. (Photo credit: tomosuke14). There is one self-sustaining wild population of whooping cranes that nests in Wood Buffalo National Park and winters in Texas at the Aransas National Wildlife Refuge. But leaving the survival of the species up to one population is risky, so scientists have worked to bring population numbers back up in several innovative ways. 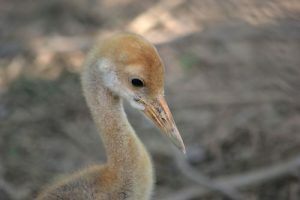 Captive breeding programs have been used to teach whooping crane chicks basic survival skills in hopes that they can thrive in the wild when they are released. Another program at Freeport-McMoRan Audubon Species Survival Center uses costumes to mimic the behavior of adult whooping cranes, teaching chicks how to care for themselves while preventing them from imprinting on humans. The whooping crane population has increased steadily due to these conservation efforts in multiple states. While the whooping crane is still an endangered species, the ESA was critical in offering the technical and legal framework to make these various conservation efforts possible, ultimately saving the species from near certain extinction. The ESA was founded in 1973 because Congress recognized that America’s natural heritage was of “esthetic, ecological, educational, recreational, and scientific value to our Nation and its people.” Because of that belief, our skies are graced again with a distinctive whooping, as cranes take flight to their winter homes. This entry was posted in ecosystems, Endangered Species Act, Partnerships, Wildlife Protection and tagged endangered species, Endangered Species Act, endangered species act success stories, endangered species list, whooping crane, wildlife conservation. Bookmark the permalink. Both comments and trackbacks are currently closed. Hope and appreciation to all who keep the faith – even more so during these times. Thanks!